Current fall delivery bids are near $3.60 per bushel for corn and $9.60 per bushel for soybeans. At those prices, high yields are needed for farmers to break-even on cash rented farmland. Alternatively, at trend yield levels, prices need to be above $4.00 per bushel for corn and $10.00 per bushel for soybeans for farmers to break-even. This 2018 situation is roughly the same as in 2016 and 2017. In those two years, both corn and soybean yields were significantly above trend, boosting revenue and causing net incomes on many farms to be positive. Whether above trend yields happen in 2018 remains to be seen. Incomes could turn out to be positive in 2018. However, a scenario with trend yields and prices at current fall delivery bid levels results in very low and perhaps negative incomes on many farms in 2018. Also shown in Table 1 are trend yields. A trend yield give an expected yield for a year. 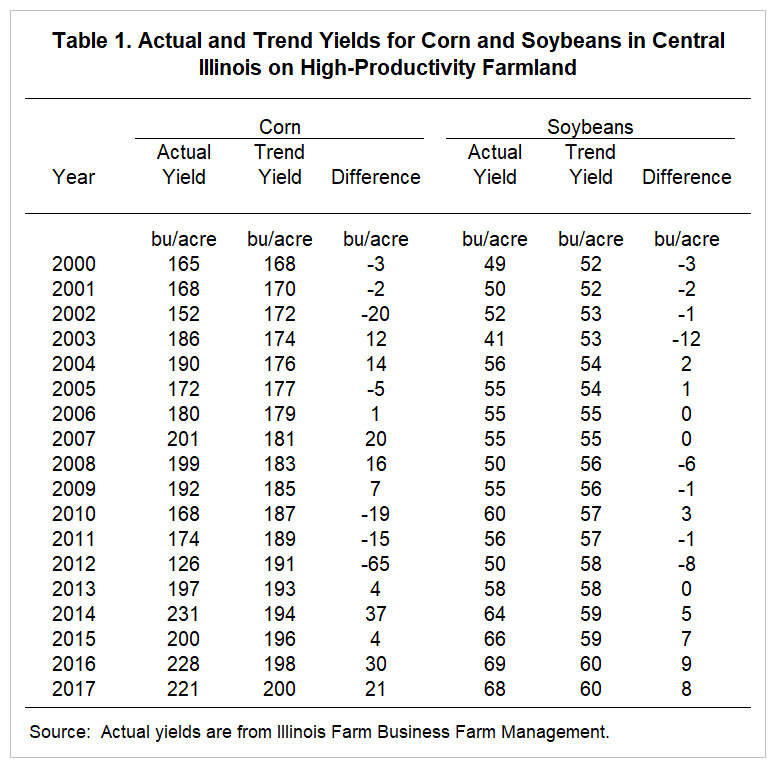 Trend yields shown in Table 1 are based on state yields from 1972 to 2017, with adjustments made for central Illinois. Reflecting technological progress in agriculture, trend yields have been increasing 1.9 bushels per year for corn and .5 bushels per year for soybeans. In 2017, trend yields were 200 bushels per acre of corn and 60 bushels per acre for soybeans. Since the 2012 drought year, all actual yields have been at or above trend (see Table 1). Corn yields were 4 bushels above tend in 2013, 37 bushels in 2014, 4 bushels in 2015, 30 bushels in 2016, and 21 bushels in 2017. Soybean yields were 0 bushels above trend in 2013, 5 bushels in 2014, 7 bushels in 2015, 9 bushels in 2016, and 8 bushels in 2017. These above trend yields lead to higher revenues. In the past two years, corn averaged 25 bushels above trend. At a price of $3.40, these 25 bushels above trend contributed $85 per acre more to revenue. In 2016 and 2017, soybean yields have averaged 8 bushels above trend. At a $9.50 soybean price, these 8 bushels contributed $76 per acre more to revenue. These additional revenues were calculated without considering the impact that high yields had on crop prices. Above average yields in Illinois lead to higher corn and soybean supplies, which then decrease corn and soybean prices. Even without this consideration, it is important to realize that higher yields contributed to revenue and income in 2016 and 2017. Without above-trend yields, corn and soybean prices must be higher than current fall delivery bids for farms to break-even in 2018. On the other hand, a continuation of high yields would result in roughly break-even profits for corn and soybeans given current bid levels for fall delivery. To illustrate, break-even prices are calculated for two yields: 1) a trend yield, and 2) a higher yield reflecting 2016 and 2017 conditions. Resulting break-even prices are shown in Table 2. For corn, break-even prices are calculated given $801 per acre in costs including non-land costs of $534 per acre in non-land costs and a cash rent of $267 per acre (see Revenue and Costs for Producing Corn and Soybeans). Owned and share-rent land may have lower break-evens depending on debt levels and terms of the share-rent agreement, respectively. Trend yield for central Illinois high-productivity farmland in 2018 is 202 bushels per acre. The resulting break-even price is $3.97 per bushel ($801 in costs / 202 bushels per acre). Conversely, a high yield of 229 bushels per acre has a break-even of $3.50 per bushel ($801 per acre / 229 bushels per acre). Current fall delivery bids for corn in central Illinois are near $3.60 per bushel. As expected given a $3.97 break-even price, a $3.60 price produces a loss at the 202 bushel trend yield. The loss equals -$74 per acre ($3.60 price x 202 yield – $801 costs). Conversely, a $3.60 price result in a profit of $23 per acre given the high yield of 229 bushels per acre ($23 profit = $3.60 price x 229 yield – $801 total costs). 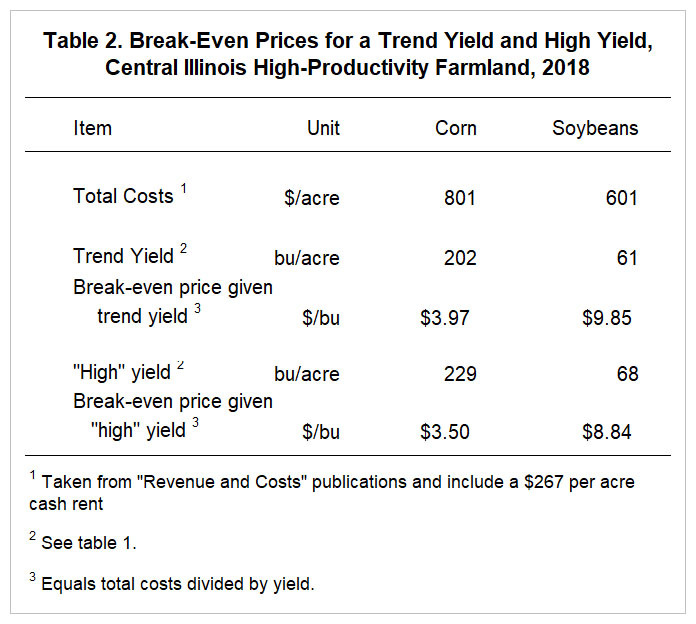 For soybeans, break-even prices are calculated for costs of $601 per acre including non-land costs of $334 per acre and a cash rent of $267 per acre (see Table 2). A trend yield of 61 bushels per acre gives a $9.85 per bushel break-even price ($9.85 = $601 costs / 61 yield). A “high” yield of 68 bushels per acre has an $8.84 break-even price ($8.84 = $601 / 68 yield). Current fall delivery bids for soybeans are near $9.70 per bushel. At a $9.70 price, a trend yield of 61 bushels per acre produces a loss of -$3 per acre ($9.70 price x 61 yield – $601 costs). A $9.70 price results in a profit of $65 per acre at the high yield of 68 bushels per acre ($65 = $9.80 price x 68 yield – $601 costs). Budgets for 2018 developed with a $3.60 price for corn and $9.70 price for soybeans will generate negative cash flows on many farms that cash rent farmland. Either higher prices or higher yields are needed for positive cash flows. As farmers plan for 2018, cash flow planning will result in dreary income projections on many farms. The budgeting situation in 2018 is roughly the same as it was in 2016 and 2017. In the winter of 2016 and 2017, either above trend yields or higher prices were needed to produce positive incomes. In those two years, higher yields resulted in higher revenues and positive incomes on many Illinois farms. Just as in 2016 and 2017, higher yields in 2018 could result in positive incomes on most Illinois farms, but there is no guarantee of this occurring. Higher prices are also possible, particularly if lower yields occur in central Illinois. Trend yields in Illinois likely would be widespread over a wide area resulting in reduced corn and soybean supplies and higher prices. With trend yields, above $4.00 corn prices and above $10 soybean prices are possible. Again, those higher prices are not guaranteed if yields are closer to trend. Low to negative incomes will result if prices continue at their current levels and yields are close to trend. This situation could arise if Illinois has near trend yields and other areas of the Corn Belt have better than trend yields. Similar to recent years, expected yields and fall delivery prices during the winter months will result in losses on many farms, particularly those who rent a majority of their farmland. Above-trend yields, higher prices, or a combination of the two could again result in positive returns. Time will tell. Still, it is a rather uncomfortable position to be in where realistic yield and price expectations result in very low incomes. Schnitkey, G. "Revenue and Costs for Corn, Soybeans, Wheat, and Double-Crop Soybeans, Actual for 2011 through 2016, Projected 2017 and 2018." Department of Agricultural and Consumer Economics, University of Illinois at Urbana-Champaign, July 2017.